One year ago, NASCAR Winston Cup Series crew chief Kevin Hamlin was a virtual unknown, directing a stagnant second-year team and it's underrated and unlucky driver Mike Skinner. Hamlin really wasn't pressured to win, or even contend for a win. Then came the switch. Unhappy with his teams' performances over the first third of the 1998 NASCAR Winston Cup Series season, car owner Richard Childress knew it was time for a change. Following an emotional victory in the Daytona 500, his prime time driver -- Dale Earnhardt -- sunk to 12th in the points standings over the next three months. "We have to do something," Childress said at the time. "Both programs are struggling and we're not accomplishing anything by running for 20th position. Our sponsors deserve a better performance that what we're giving them." In the wake of an uncharacteristic slump, Childress opted to swap crew chiefs between the No. 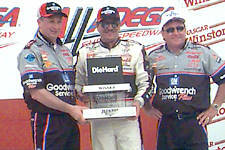 3 GM Goodwrench Service Plus team and the No. 31 Lowe's Home Improvement Warehouse team, sending Larry McReynolds to Skinner and Hamlin to Earnhardt. Suddenly, the spotlight glared on Hamlin at every turn. "It was kind of awkward at first," admits Hamlin. "With Skinner they really didn't expect us to be in contention every week, so nobody really paid us much attention. We just went about our business. With Dale it is expected not only to be in contention, but be in the winner's circle. If you're not winning they want to know why. If you are winning they want to know what took you so long." This weekend at Michigan, the Hamlin-Earnhardt marriage will celebrate it's one year anniversary. The season started out well again for Earnhardt, as he nearly won back-to-back Daytona 500s, giving Jeff Gordon all he could handle over the final two laps. After a brief dip in performance, the No. 3 team is right back where it needs to be, having catapulted 13 positions up the points chart and into seventh place over the past seven races. During that span, Earnhardt has recorded three top-10s including a dominant victory in the DieHard 500 at Talladega Superspeedway. Following that race, Earnhardt knew the chemistry between himself and Hamlin was extraordinary. "Kevin is a good guy," remarked Earnhardt after winning Talladega last month. "He sort of thinks like I do and he's always got something in his mind. Nine times out of 10 I tell him what I think and he's thinking the same thing. Kevin doesn't say much until he has thought it through, I like that because he is looking for one of two answers and usually it's the one I give him." Although the shy Hamlin was somewhat forced into the limelight, he has accepted the challenge well, and has intentions of continuing the good fortune he has helped bring to the No. 3 team. "Honestly, to be crew chief for Dale Earnhardt and this team I feel like I'm the luckiest crew chief in the garage area," said Hamlin. "I didn't necessarily volunteer for the position, but after being here, it's a fun position to be in. Dale and I seem to have a good relationship, and I think we're going to build it into something bigger and better, and hopefully get Dale that eighth championship."